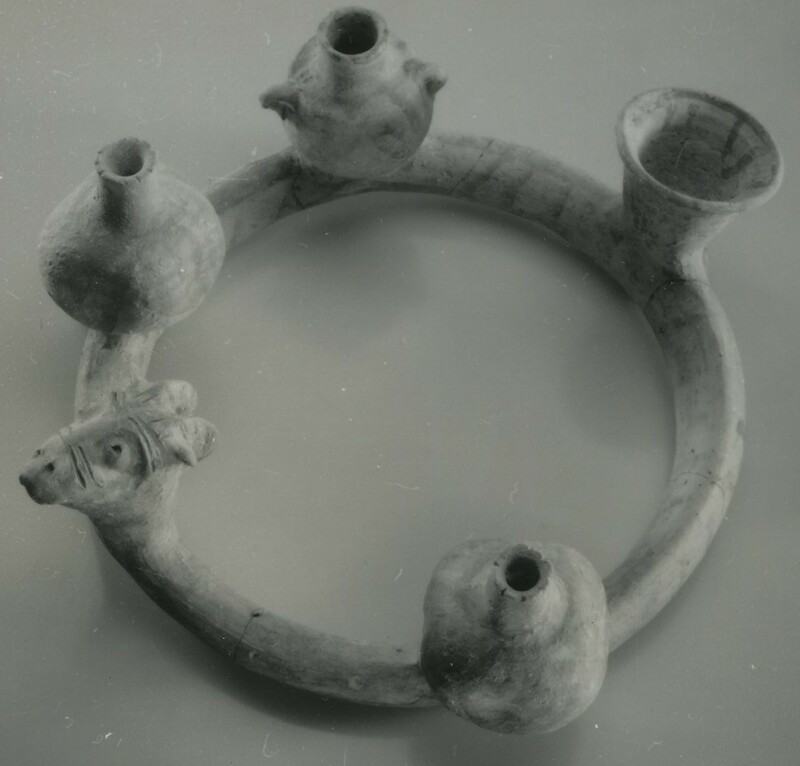 This kernos—a pottery ring with small vessels for holding offerings—consists of a hollow ring with five attached recepticals: two pomegranates, one jar, one cup, and one zoomorphic model that might be a bull or a calf. The kernos was found at Tell el-Hammah in a large room in the western complex, dated to the tenth or ninth centuries BCE. The exact function of the room is unclear, but the kernos was part of a rich assemblage of finds, including several figurines, a multi-handled krater (a very large vase) decorated with animal appliques, a cat amulet, astragali (small joint bones), and a censer lid. The term kernos (plural: kernoi) is borrowed from Greek archaeology, and there have been several suggestions that the kernoi found in Israel may have originated in the Aegean. Vessels like this one and the Megiddo Kernos were used for the ritual pouring of libation or drink offerings. Liquid—probably wine, oil, or milk—would be poured into the pomegranates, jar, or cup and then flow around the hollow ring at the base, so that it could either be poured out of the nostrils of the animal, or drunk from the cup itself. The circulation of the liquid perhaps symbolised the fertility of the earth, as it flowed through objects symbolizing animals, birds and plants. Libation rituals are widely known in the Hebrew Bible and seem to have been a part of daily religious life that anyone could enact in any location. Hollow clay kernos ring with five projections, decorated with red lines.